The parish follows the new diocesan programme for preparing Year Group 4 children for these sacraments. The resource materials are taught both in school and in catechist groups. At regular Sunday Masses, the children and their families share particular liturgies with parishioners. 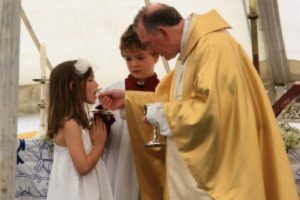 The general emphasis is that the whole community takes part in various ways in helping the children appreciate Jesus’ presence in these two beautiful sacraments.